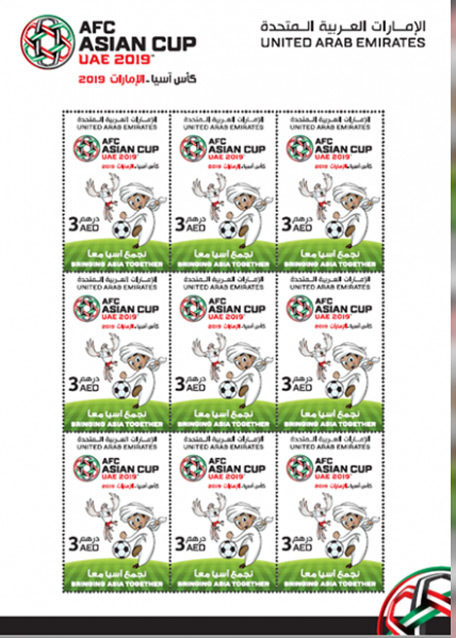 A commemorative stamp has been issued by Emirates Post to mark the holding of the AFC Asian Cup – UAE 2019 tournament, which kicked off on 5th January. Designed by Emirates Post and printed by Oriental Printing Press, Bahrain, the AED 3 stamp is issued in sheets of 9, with dimensions of 30 x 45 mm, and with a total of 25,020 stamps being issued. 4,000 First Day Covers, have also been issued, priced at AED 4, and 1,000 special postcards, priced at AED 5. The issue date is 7th January.